A New Form of Slavery? 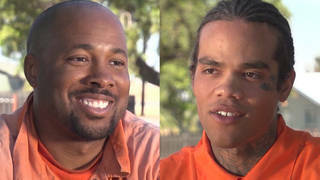 Meet Incarcerated Firefighters Battling California’s Wildfires for $1 an Hour | Democracy Now! We go behind the scenes of California’s raging climate-fueled wildfires with the hidden men and women on the front lines of the state’s ever-growing fire season: prisoner firefighters. Of the 13,000 firefighters battling blazes across the state, more than 2,500 are prisoners. While salaried firefighters earn an annual mean wage of $74,000 a year plus benefits, prisoners earn $1 per hour when fighting active fires. According to some estimates, California saves up to $100 million a year by using prison labor to fight its biggest environmental problem. The Democracy Now! team traveled on Sunday to the Delta Conservation Camp, a low-security prison about an hour north of San Francisco where more than 100 men are imprisoned. We interviewed incarcerated firefighters who had just returned from a 24-hour shift fighting the Snell Fire in Napa County. AMY GOODMAN: We’re broadcasting from San Francisco, the site of this week’s Global Climate Action Summit. We begin today’s show behind the scenes of California’s raging climate-fueled wildfires, with the hidden men and women on the front lines of the state’s ever-growing fire season: prisoner firefighters. Of the 13,000 firefighters battling blazes across California, more than 2,500 are incarcerated. While salaried firefighters earn an annual mean wage of $74,000 a year plus benefits, prisoners earn a dollar per hour when fighting active fires. According to some estimates, California saves up to $100 million a year by using prison labor to fight its biggest environmental problem. In August, California Governor Jerry Brown thanked the firefighters on the front lines, including those who are incarcerated. GOV. JERRY BROWN: There’s a tremendous effort fighting these fires, and I want to personally thank all the firefighters who are on the line—the members of Cal Fire, also the National Guard and the thousands of inmates who are also on the line fighting to protect lives and bring these fires to a quick close, to the extent that’s at all possible. AMY GOODMAN: Incarcerated firefighters live in 44 low-security field camps throughout California, including three camps for women and one for juveniles. They’re routinely called upon to fight the state’s most dangerous fires. In the last year alone, the state has seen the largest fire in California history—the Mendocino Complex Fire—and the most destructive, the Tubbs Fire in 2017, which killed 24 people and destroyed more than 5,600 homes. In 2017, prisoner firefighters spent 4 million hours on active fires. As climate change leads to longer and more dangerous fire seasons in California and the state’s firefighting agency Cal Fire is running out of money, California is increasingly relying on its prisoner fire force to combat wildfires. Prison firefighters earn time off of their sentences for good behavior, typically two days off for each day served. But critics of the program say the state is exploiting prisoners’ eagerness to earn time for early release. Well, the Democracy Now! team traveled to the Delta Conservation Camp about an hour north of San Francisco Sunday, to a low-security prison where more than a hundred men are imprisoned. We interviewed incarcerated firefighters who had just returned from a 24-hour shift fighting the Snell Fire in Napa County. We spoke to them under the close surveillance of prison administrators. I began by talking to some of the officials from the California Department of Corrections and Rehabilitation. SGT. STEVEN REEDER: I’m Sergeant Reeder. I’m the assistant camp commander here at this camp. AMY GOODMAN: And what fire did they just come in from? SGT. STEVEN REEDER: They came in from the Snell Fire. AMY GOODMAN: And where is the Snell Fire? SGT. STEVEN REEDER: It’s southeast of Middletown. AMY GOODMAN: And how long has it been burning? SGT. STEVEN REEDER: Yesterday afternoon. It started, I think, about 3:00 yesterday, and it went up to 1,700 acres by like 8:00 last night. AMY GOODMAN: And how important are these fire camps of incarcerated people to fighting fires in California? SGT. STEVEN REEDER: The inmate firefighters are the backbone of Cal Fire. They do all—they get the toughest assignment there is, out there. AMY GOODMAN: What’s the toughest assignment? SGT. STEVEN REEDER: Whatever they’re asked to do. Usually it’s cutting line where a dozer can’t go. So they get the toughest assignments in the worst conditions, 110 degrees in the middle of the sun, carrying in—wearing two layers of clothing, carrying in 40 pounds of gear. And then they have to carry all their food and water for a 24-hour shift, and then swing a tool the whole time. AMY GOODMAN: And you’re saying they do the toughest jobs? SGT. STEVEN REEDER: They get the toughest assignments there is. AMY GOODMAN: How much do they get paid? SGT. STEVEN REEDER: A dollar an hour. AMY GOODMAN: So the state is really dependent on these prisoner firefighters. SGT. STEVEN REEDER: Definitely, yes. They save a lot of money for the state. AMY GOODMAN: Do you know about how much? SGT. STEVEN REEDER: I’ve heard anywhere from $60 million to $100 million a year. CAPT. TRACY SNYDER: My name is Tracy Snyder. I’m a correctional captain with CDCR, California Department of Corrections and Rehabilitation. AMY GOODMAN: And talk about what happens here. How often do they fight fires? How often are they just here at camp? CAPT. TRACY SNYDER: So, obviously, fighting fires, that’s unpredictable. Last year was one of our biggest fire seasons. 2015 was another big fire season. Last year, obviously, fire season lasted for somewhere around six to eight months. The Santa Rosa fire, the Napa fire, these guys responded to that. The Thomas Fire down in Southern California. AMY GOODMAN: Would you call these men heroes? CAPT. TRACY SNYDER: I would, yes. They do an excellent job for the state of California. When you see the devastation in Santa Rosa and Napa last year, and Montecito down in Southern California with the Thomas Fire, these guys, as the sergeant said, they’re the backbone. They do a great job. A great job. And I appreciate them. AMY GOODMAN: After the returning firefighters have breakfast, I sit down with a few of them under the watchful eye of prison officials. DANTE YOUNGBLOOD: My name is Dante Youngblood. I came to camp 14 months ago. I’ve been in jail nine years. AMY GOODMAN: How much more time do you have to serve? DANTE YOUNGBLOOD: One more year. AMY GOODMAN: So talk about the work you do here. Are you risking your life? DANTE YOUNGBLOOD: I went in—well, I guess you could say you’re risking your life, yes, but you’re not really in life-threatening situations. Ninety-five percent of the time, you’re not in a life-threatening situation. You’re in a controlled environment. You know—if you’ve been doing it for a while, you know what to do. But it’s a hard job, for sure, because we’ve got to cut line. The fire could be right there, and then we be cutting line on the fire to stop it from coming. AMY GOODMAN: What do you mean, cutting line? DANTE YOUNGBLOOD: Well, we cut a line with a McLeod. AMY GOODMAN: What is a McLeod? DANTE YOUNGBLOOD: It’s a tool. It’s a tool. It’s like something like a hoe, like you would use in your garden. And we cut line with it, 4-foot line, to stop the fire from coming. AMY GOODMAN: So you’ve had the fire as close as like a couple feet from where we are? AMY GOODMAN: Is it scary? DANTE YOUNGBLOOD: Well, I guess it gets—it used to—when you first start it, you will be scary. Some of the inmates, some of the other people be scary, some of the crew members. But, to me, no, it’s not. It’s just regular to me. To me, it’s just regular work. I done already program myself to just—whenever we go, we just go. It’s just—it don’t even bother me. I just—it’s just all right. It’s just work. It’s work that we’re doing. AMY GOODMAN: Last night, one of the guys fell down the hill? DANTE YOUNGBLOOD: Well, just—it just—it’s slippery, rocks. Rocks are slippery. He just—he didn’t fell that bad. It just was a little fall. He just sprained his ankle or something. But it happens. It do happens. The trees fall on you. All of that. Like the last fire we was at, I think, what, a month ago, a firefighter died, because a tree fell on him. AMY GOODMAN: A free firefighter, or—? DANTE YOUNGBLOOD: Yeah, a free firefighter, because a tree fell on him. That’s how it goes. It gets crazy out there sometimes, but most of the time we know what’s going on. AMY GOODMAN: Are you shoulder to shoulder with the Cal Fire firefighters? DANTE YOUNGBLOOD: Yes. Yeah, we cut line together. We be out there. We don’t—they don’t—we’re not split up from them. Like we’re not like, “Oh, bring the inmates over here.” Nah, it’s not like that. We just—we all out there together. We all out there helping each other. Like if I walk by one, and I see a Cal Fire or any firefighter and he need help or something with the hose or something like that, I help him. Because they’ll help us, too. We’re all here to help each other and make sure everybody’s safe. AMY GOODMAN: How much money do you make? DANTE YOUNGBLOOD: A dollar an hour. AMY GOODMAN: When you’re fighting the fire? DANTE YOUNGBLOOD: Yes, when you’re fighting a fire, a dollar an hour. AMY GOODMAN: So, how—for example, last night, how long were you fighting the fire? DANTE YOUNGBLOOD: Probably 20-something hours, so we probably made $20, $22, $24. AMY GOODMAN: What do you think of that? DANTE YOUNGBLOOD: Well, I don’t think—I think we should make—of course, I would say, anybody that got a job, you would think you should make more. I always thought we was—I thought we was getting $2 until I came to fire camp. But, you know, it’s cool, though. I mean, we’re making money for something that we would probably do for free anyway just for the time cut. So it’s all right. But I would prefer, yes, we get more money, of course. Anybody in a working position would want to make more money. AMY GOODMAN: So, you’re saving the state, to say the least, a lot of money. Some say it’s something like $100 million a year. DANTE YOUNGBLOOD: I don’t know. I mean, of course that, I’m sure. But, I mean, we don’t even—some people don’t even—we look at it as getting the time. The time cut is more than the money to us. We’d rather make the money, for sure, because we still can send money to our families. We still send money home. But yeah, we only make a dollar an hour on the fires. AMY GOODMAN: So how old were you when you first went to prison? DANTE YOUNGBLOOD: It was nine years ago. I think I was 27. AMY GOODMAN: Did you want to talk about what happened? DANTE YOUNGBLOOD: Nah. I just made bad choices. AMY GOODMAN: Has being here at camp changed your thinking about the world? DANTE YOUNGBLOOD: Yes. I mean, I could say I’ve learned a lot, just that I can do more than what I used to do, that I can do right, I can do better things with my life than just commit crime and do things like that. I figured out I can do a job. I could work. I never had a job a day in my life. I never cashed a check. Literally, I ain’t never cashed a check in my life. I ain’t never used a credit card. It’s crazy. I just sound like I’m from the mountains or something. AMY GOODMAN: What made you decide to do this interview? It’s the first time you’ve talked to a journalist? DANTE YOUNGBLOOD: Because I might want to go to Hollywood and be an actor or something. I want to see if I can do it. I’m serious! Plus, I wanted y’all to get our perspective. Because I know you can hear it from the guards, from the captains, but—and then I know a lot of people here probably don’t want to do the interview, probably scared or just don’t want to do it, but I’m not. I do whatever I want to do. AMY GOODMAN: Can you vote? DANTE YOUNGBLOOD: No felons can vote. AMY GOODMAN: You know, that’s interesting, because in Vermont and Maine, they can vote from jail. DANTE YOUNGBLOOD: No felons can vote in California. AMY GOODMAN: Would you like to see that change? DANTE YOUNGBLOOD: Yes. But we can’t talk pol—we don’t need to talk politics. CAPT. TRACY SNYDER: Let’s just talk about camp. SGT. STEVEN REEDER: Camp only. We’re not talking voting, politics. SGT. STEVEN REEDER: Camp only. AMY GOODMAN: At this point in the interview, Sergeant Reeder steps in to end the conversation with Dante, telling us political questions aren’t allowed. Later, the commander comes over. LT. SID TURNER: Yes, I’m Lieutenant Sid Turner. I’m the camp commander here at Delta Conservation Camp. AMY GOODMAN: Talk about how hard this work is. LT. SID TURNER: This is—for an inmate in the state of California, this is the hardest work that you’re going to find when they’re out there on the line doing the work that they’re expected to do. It’s extremely physically demanding. The hours can be exhausting at times. For example, last year, when we had the Napa fires, they were actually out for three days straight, because the resources within the state were so tapped that it took that long just to get them relieved and off the lines. AMY GOODMAN: And they make just a dollar an hour fighting these fires next to Cal Fire firefighters? LT. SID TURNER: That is correct, but understand there’s a big difference between Cal Fire firefighters and an inmate firefighter. AMY GOODMAN: Do you think they should be paid more, the prisoners? LT. SID TURNER: I believe that they should make more than the dollar an hour. They’ve been at that rate of pay for many decades now at this point in time. AMY GOODMAN: So it seems like the state would be threatened if people’s time was even cut or if as a result of overcrowded prisons, more prisoners were released. Of course, they would be the prisoners who had the lowest sentences, and those are exactly the prisoners who get into these kind of camps. They would lose that kind of labor, the firefighting labor. LT. SID TURNER: Potentially, very much so. There is definitely a need for this type of a resource—the hand crews to go out and cut line in areas that aren’t accessible to equipment such as bulldozers and things of that type. So California needs hand crews. If we don’t have the inmates to perform that function, then they’ve got to find the labor from someplace else. AMY GOODMAN: Sergeant Reeder, do you think the prisoners should be paid more for fighting fires? AMY GOODMAN: They’re doing the same work as Cal Fire, the firefighters who are free. SGT. STEVEN REEDER: I think we do harder work. I think we get the harder assignments. Nobody else can touch us. AMY GOODMAN: The question of how much California relies on prison labor, particularly when it comes to fighting wildfires, came under scrutiny in 2014. Lawyers in the state Attorney General’s Office argued in federal court that a program to parole more prisoners would drain the state’s source of cheap labor. The California attorney general at the time was, well, now U.S. Senator Kamala Harris. She later said lawyers in her office argued the case without her knowledge. Harris said the idea of incarcerating people as a source of labor evokes images of chain gangs. I sit down with another prisoner who just came back from fighting the Snell Fire. MARTY VINSON: My name is Marty Vinson. I’m 25 years old, and I came to this camp about mid-July of this year. AMY GOODMAN: What has been the most difficult fire that you’ve fought? MARTY VINSON: At first I wanted to say at Eel River, when I went to Detwiler last year. Detwiler was a pretty bad fire. But the River Fire this year at Delta, I think, topped it, because it was the most like, I guess, harm’s way I’ve been in. It was a situation where we was back burning, and they had one of our saw teams, which was my saw, me, bump down with Crew 3 to cut on the other side on the green to where if there are embers coming across, it’s still pushed back more to where it just doesn’t catch. And it led to a point where it flared up more than it had to on the fire that was burning. And when it did that, it jumped the line. So when it jumped the line, mind you, the puller—I left out we carry a gallon of gas on our back. So, when that happened, we pretty much immediately have to run down the mountain. And as we ran down the mountain, we ran into the highway. As we ran into the highway, one of the captains escorted us down the street. But as we was going down the street, now the fire jumped from where it was burning at, where it was supposed to burn at, to the green across the road. And within seconds, the whole highway went from a nice bright day to just dark smoke and fire everywhere. So we had to run as far pretty much down that highway until it was green again. And then as it continued to burn and the black was there and it was safe to go back, we actually had to walk back in there. So, just being put in a bad predicament like that to where that adrenaline is really pumping and you try to figure out the best thing to do because possibly your life is on the line, I would want to say the River Fire this year was the worst one for me. AMY GOODMAN: Do you think of yourself as a hero? MARTY VINSON: I like to look at myself as somebody that I want to be here for whoever—like, whoever needs me, I want to be there for them. Just last night on this fire, we had somebody who came back not too long ago where the terrain of where we was climbing up, cutting line, there were just too many loose boulders. And, you know, we always try to do what we have to do, but still provide safety while doing it. And it’s just one of those situations where it’s no one’s fault, but it happens. And while they was cutting line, a boulder actually fell and hit him. And he popped something in his knee, and it just swelled up. And it came to a point where we didn’t really have no answer to what are we going to do, how are we going to get him out of here. It’s night. They don’t do no airlifts at night. They don’t want nothing in the air at night. So it led to the possibility of us just bedding down at the bottom of this creek and wait until like morning. And it was just something where—it’s a natural thing about me: I want to be there for people. So I just volunteered and said, “Well, look, me, personally, I don’t feel like it’s relevant for us to stay down here.” So I just volunteered to take my pack off and carry him up the mountain. AMY GOODMAN: So you carried him up from below, near the creek? MARTY VINSON: Yes. The first part was maybe the worst part. It was real steep. A lot of people didn’t think it would actually happen like that, but it was something that I just pushed myself to say I’m going to do, and I got it done. We went going straight uphill to having to go sidehill, which that was another cautious area, because the road was probably like two feet wide. So it was something—it took its time. It went from 2:00 in the morning to like almost 5:00 in the morning, but we got him up there, and now he’s back here. AMY GOODMAN: You’re risking your life here. MARTY VINSON: It’s exactly what’s going on. Everything we do, you know, no one’s really promised to come back. AMY GOODMAN: And how much do you make? MARTY VINSON: A dollar an hour. AMY GOODMAN: When you’re fighting a fire. MARTY VINSON: When you’re fighting a fire, a dollar an hour. When you’re on typical grade, you make $1.45 a day. AMY GOODMAN: Some have called it slave labor. What do you think of that? MARTY VINSON: I don’t really want to call the work slave work, but I feel like it’s their whole mentality and what they’re thinking about at the end of the day. No matter whether we’re incarcerated or we’re free, we’re getting paid a dollar an hour. AMY GOODMAN: That was Marty Vinson, an incarcerated firefighter at the California Department of Corrections and Rehabilitation’s Delta Conservation Camp, low-security prison camp in Fairfield, California, where more than 100 incarcerated firefighters are housed. They earn a dollar an hour for fighting California wildfires, saving the state $100 million per year. Special thanks to Democracy Now!’s Libby Rainey, John Hamilton, Carla Wills, Ariel Boone and Mike Burke for that report. When we come back, we’ll be joined by Amika Mota. She, too, fought fires when she was incarcerated. Stay with us.